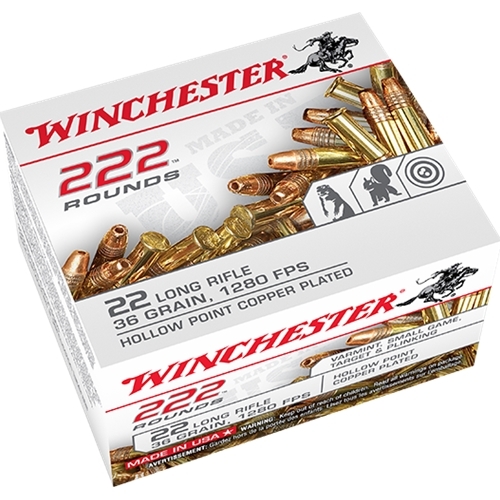 Winchester 22 Long Rifle 36 Grain Plated Lead Hollow Point 222 Round Box ammo for sale online at cheap discount prices with free shipping available on bulk 10mm Auto ammunition only at our online store TargetSportsUSA.com. Target Sports USA carries the entire line of Winchester ammunition for sale online with free shipping on bulk ammo including this Winchester 22 Long Rifle 36 Grain Plated Lead Hollow Point 222 Round Box. Winchester 22 Long Rifle 36 Grain Plated Lead Hollow Point 222 Round Box ammo review offers the following information; This 22 Long Rifle by Winchester ammo has 36 grain Plated Lead Hollow Point bullets. This specific Winchester 22 Long Rifle ammo is packaged in boxes off 222 rounds and cases of 2220 rounds. This Winchester 22 Long Rifle is non corrosive, reloadable, with boxer primer, and brass casings.